The aubergine is native to South and East Asia and is thought to have been introduced to the Mediterranean area by the Arabs or Africans in the middle ages. The first written record of it in England was in the 16th century when an English botany book of 1597 wrote “This plant groweth in Egypt almost everywhere… bringing forth fruit of the bigness of a great cucumber….”. I love that quote – cheeky! 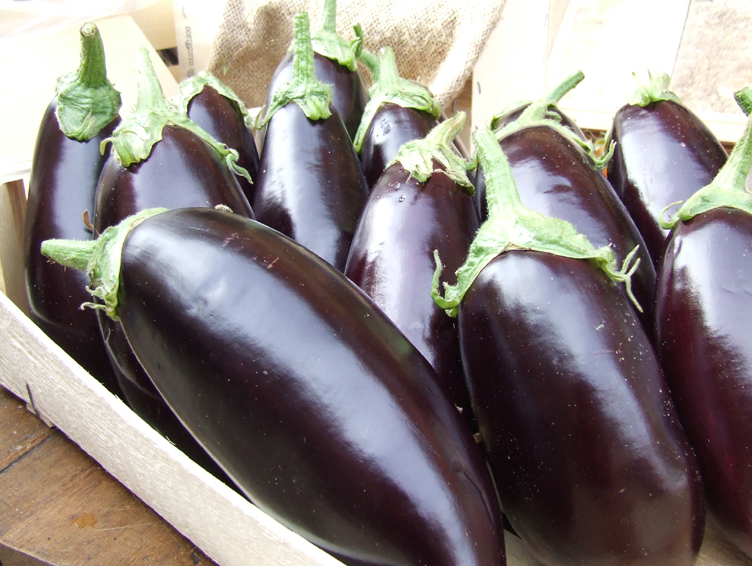 There are a number of variants of aubergine; small, large, round, elongated ovoid, dark purple, pink, white, yellow, green, variegated colouring. The ones normally found in the UK and US are large, cucumber-sized elongated ovoid shaped, dark purple in colour although you can certainly find the small and round versions in South Asian supermarkets. The flesh of an aubergine can be quite bitter so lends itself well to slow roasting and frying allowing the bitter starches to break down into sugars. The flesh can absorb a lot of oil during cooking – salting it can reduce the amount absorbed and draw out some of the moisture. The aubergine is not especially high in any vitamins or minerals but is low in fat (when uncooked) and contains a decent amount of fibre and carbohydrate. 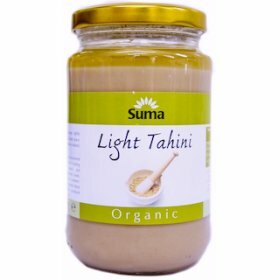 It makes for a great meat substitute in vegetarian and vegan meals as its flesh has a good firm texture and it is fantastic in curries or stuffed for example with rice, nuts, vegetables, meat and herbs and spices. 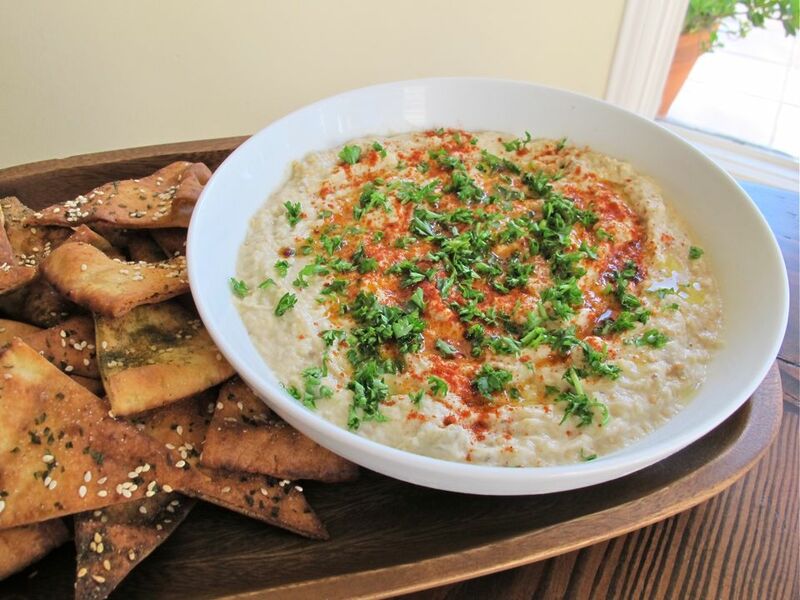 In baba ganoush it is combined with tahini, a paste made of sesame seeds (which are a really good source of a variety of minerals: copper, manganese, calcium, phosphorous and fibre), which puts it in league with middle-eastern dips such as hummus as an amazing accompaniment to pitta bread or vegetable sticks as a healthy low in saturated fats snack. 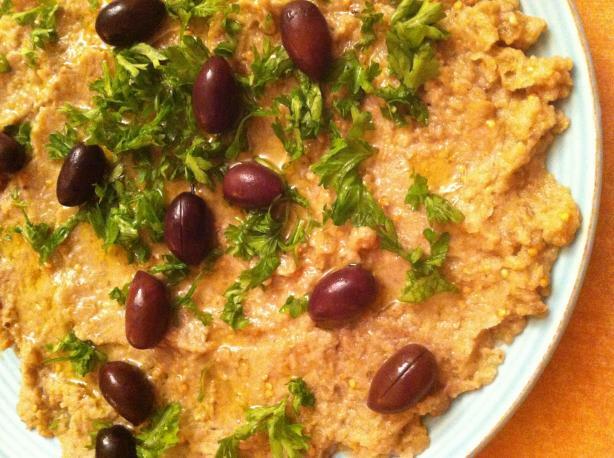 It goes great on the side of a middle-eastern or Greek style mezze with cous cous, tabbouleh or rice, salads, falafel, hummus, olives, etc. Perfect as part of the heart healthy Mediterranean diet. The variety normally found in the UK and US. Smaller, round versions would work in baba ganoush just as well. Heat oven to 150C / 300F / Gas Mark 2. Cut the top off the aubergines and slice them lengthways. Pour a little oil into your hands (from the 1-2 tbsp.) and massage it onto the skin side of each half aubergine. Do the same with the salt. Lay the aubergine halves skin side up onto a lightly greased baking tray and place in the oven. Bake for 40 mins – 1 hour, until the flesh is soft. Scoop the soft flesh of all aubergines out into a bowl. Add the garlic, tahini, lemon juice, 2 tbsp. olive oil, ground cumin and black pepper to taste. Blend all ingredients together. I use a billy-whizz handheld blender for this – just make sure you have a deep enough bowl so it doesn’t splatter all over your kitchen and shirt-frontage! Serve in a bowl topped with the chopped parsley. Have the chopped red onions and black olives as an optional extra topping for people to add as they wish. Serve with toasted pitta bread. 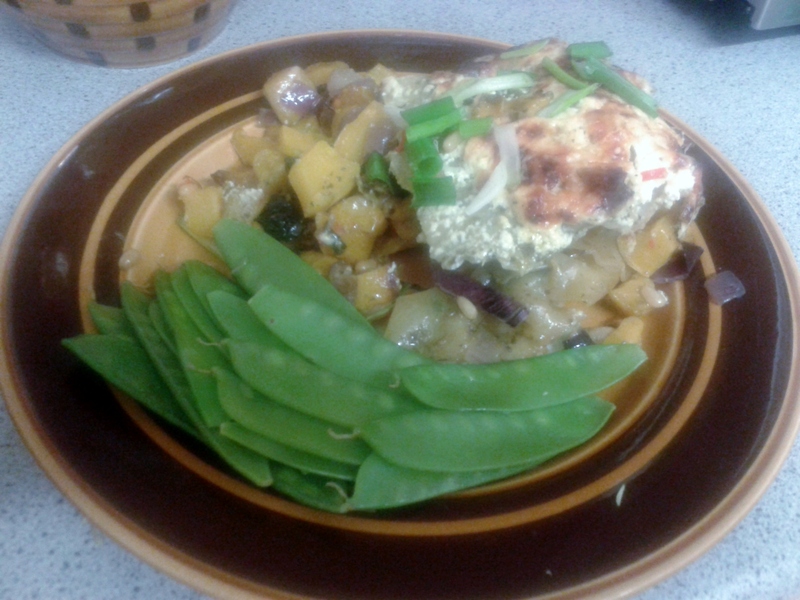 This is a real humdinger of a leftovers dish. It allows you to use up your roasted chicken meat leftovers (or omit the chicken for a vegetarian dish) and any odds and ends of Mediterranean vegetables that you might have (courgettes, aubergine and mushrooms would work just as well in this dish). The real beauty of this lasagne is that you can pack in as many vegetables as you like and, because you are roasting them, they don’t need to be in perfect form – you can catch them as they’re starting to wilt or shrivel a tad and they’ll still taste delicious roasted in oil and covered in pesto. No need for food wastage and, even better than that, one portion packs in half of your daily fibre requirements and is low in salt and saturated fats. It would make a great post exercise meal as it is high in protein to help repair muscle. Serve with a salad or some steamed green beans or mange tout. Boil a kettle of water. Place the lasagne sheets (separated from each other) in a large deep flat dish and cover with the boiled water. Place in the bottom of the oven to allow them to soften and par-cook in the hot water. Keep an eye on them to make sure they don’t overcook and break apart (they shouldn’t do). Heat the olive oil in a large, deep roasting tray in the oven for 3-5 minutes. Add the butternut squash cubes and stir to coat them in oil. Roast for 20-25 minutes. Add the chunks of onion and pepper to the roasting butternut squash. 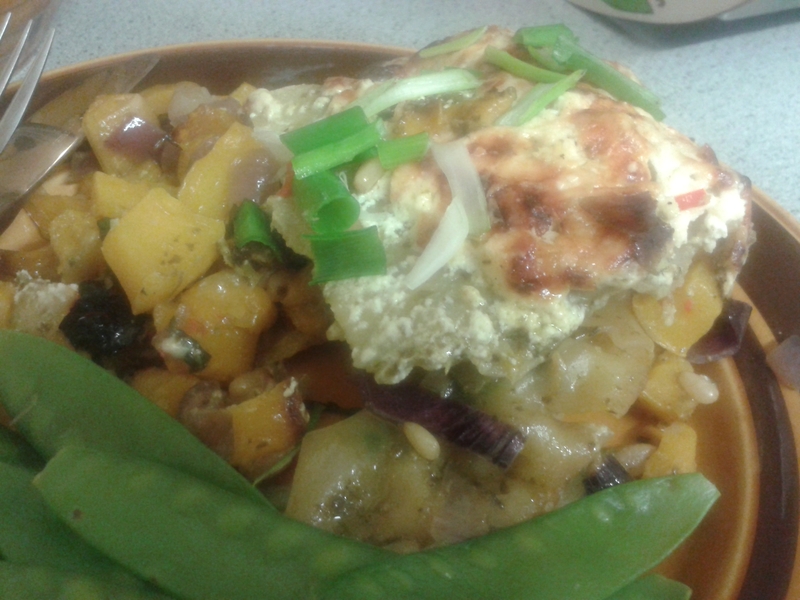 Stir all the veg round to coat in oil and replace in the oven. Roast for a further 20 minutes, until all are softened and starting to brown slightly. Add the chicken, pine-nuts, garlic and chilli to the roasted veg and stir round to coat in oil. Place the shredded spinach leaves on top of the veg and replace in the oven. Roast for a further 5-10 minutes to wilt the spinach and allow the vegetables to become infused with the chilli and garlic flavours. Remove the roasted chicken and vegetables from the oven (leave the oven on though cos the lasagne is going back in!) and stir the pesto through until they are all coated. Remove the lasagne sheets from the oven and drain off the water carefully, making sure the sheets don’t stick to each other. Hopefully they are par-cooked at this point. Start to assemble the lasagne. Place half of the roasted ingredients in a square or rectangular glass dish (one roughly 7” x 7” / 18cm x 18cm). Place half of the lasagne sheets on top – you can cut them to make them fit. Add the rest of the roasted ingredients on top and then another layer of lasagne sheets. Squash it all down as much as possible to allow the juices in the veg to cook the pasta through. In a separate bowl mix the low fat crème fraiche, half of the grated parmesan and nutmeg together and add black pepper to your own taste. 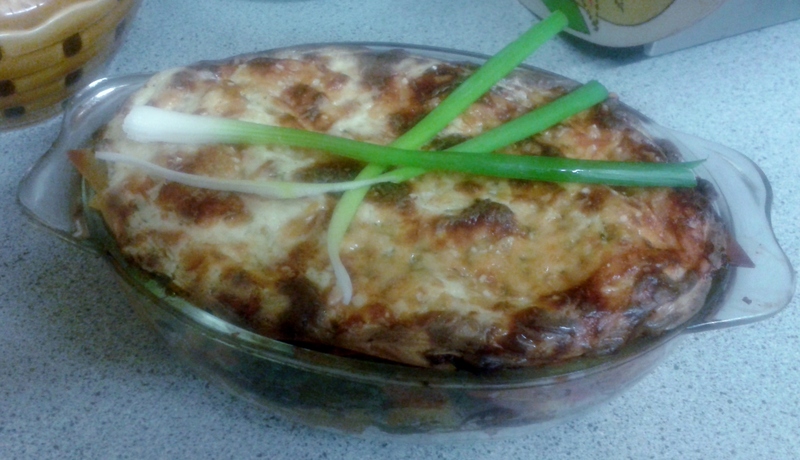 Spoon this mixture on top of the lasagne and spread out smoothly to the edges. Sprinkle the rest of the parmesan evenly over the top. Return to the oven and cook for 30-40 minutes, or until the top is nicely browned.